The recovery of non-ferrous metals is the economic basis of every recycling system. STEINERT eddy current separators with an eccentric pole system optimally meet this requirement – it is no coincidence that more than 4,000 of them are in use worldwide convincing by their high extraction volumes and durability at the same time. Following various processing stages – like for instance disintegration crushing, classification and magnetic separation – the non-ferrous metal separator facilitates the recovery of clean, marketable non-ferrous metal mixtures containing aluminium, copper, zinc or brass. The non-ferrous metal separator can therefore be used any place where non-ferrous metals can be recovered or separated, for example when processing shredded scrap, demolition waste, municipal solid waste, packaging waste, bottom ashes from waste incineration, aluminium salt slags, e-waste, wood chips, glass or moulding sand. A non-ferrous metal separator in its basic structure consists of a short stretch of belt that is driven at the feed end. There is a rapidly rotating permanent magnet system located in its discharge head pulley. In rotation this pole system generates high-frequency, alternating magnetic fields. This in turn causes strong eddy-currents in the conductive non-ferrous metal parts, which now for their part create their own magnetic fields opposing the outer fields. The non-ferrous parts are diverted from the remaining material stream due to the force impulse. 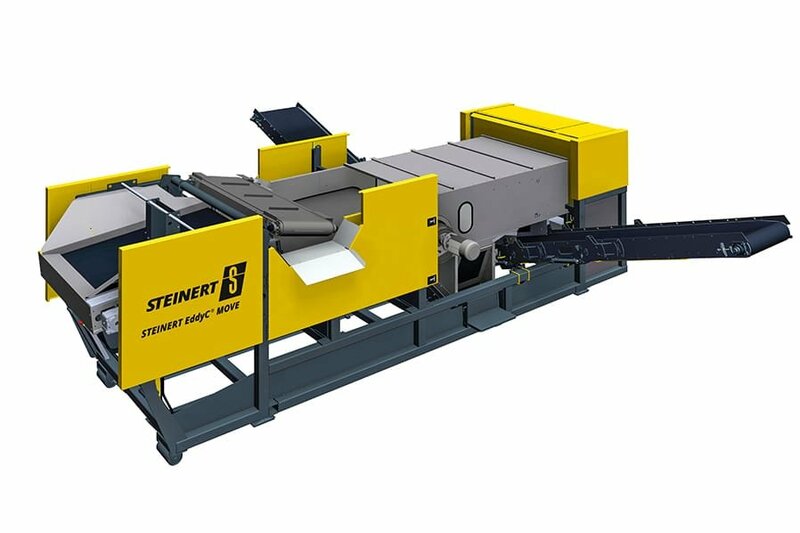 The eccentric pole system developed by STEINERT guarantees the highest efficiency – in other words optimal sorting and long-lasting operation. The magnetic pole system arranged eccentrically in the head pulley of STEINERT non-ferrous metal separators concentrates the effect of the magnetic alternating fields exactly in the area at which the material is experiencing the greatest force impact and is located at the discharge point from the conveyor belt. Adjustability of the pole system enables this position to be optimally configured to the current feed material, such that the discharge parabola is influenced to the greatest possible extent and the force effect is thus further intensified. The impact of the magnetic field often starts too early in concentric pole systems, i.e. the non-ferrous particles depart too soon from the magnetic field and are therefore inadequately diverted. On the other hand, the eccentric pole system ensures that the magnetic field's influence is only at its highest in the moment of separation and a field is not generated at other points in the belt drum. Residual ferrous metals cannot adhere to these areas of the head pulley, which reduces the wear to the belt and drum shell to an absolute minimum – this too is an essential difference to the concentric system. 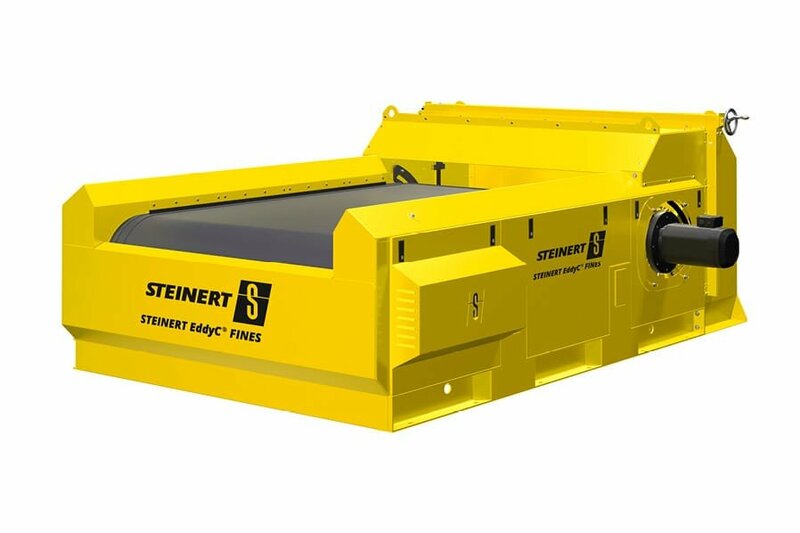 We at STEINERT achieve our extraordinary separation results through the use of neodymium-iron-boron magnets, a thin conveyor belt and an electrically non-conducting drum shell made of composite fibre materials. These ensure maximum field strengths and thus precise, efficient sorting. 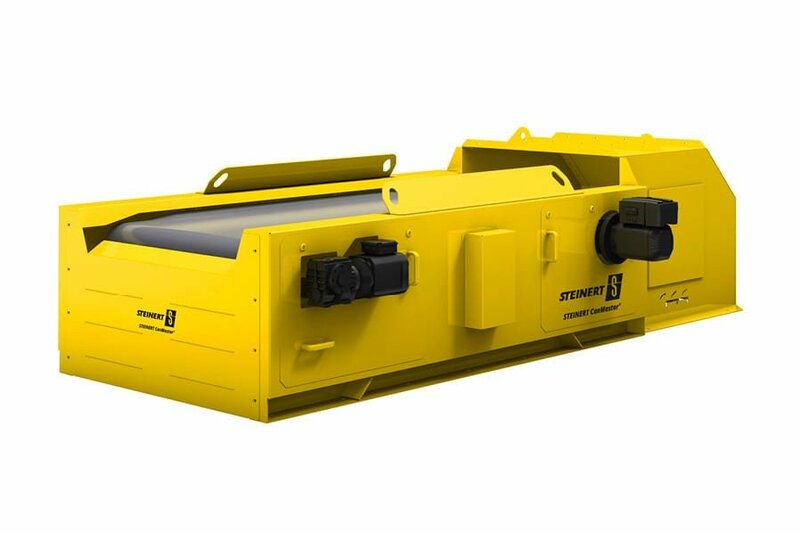 With STEINERT you can rely on by far the largest selection of non-ferrous separators – together we will find the perfect solution for your requirements, which is also cost-effective in every respect. Our wide range of models is based on the STEINERT EddyC® , STEINERT EddyC® FINES and STEINERT CanMaster® device series with special magnetic pole systems and working widths from 500 to 2,500 mm. We also offer you supply chutes, transfer units and controllers specifically adapted to the respective application for maximum efficiency. The optional rotary splitter, for example, improves the extraction of long, flat materials. The different controllers also enable connection to a central plant control system as well as electric regulation of the separating splitter.